Quarter Package: 3D Anaformable Curv® composite. Lining Material: HYDRA MAX 2 with integrated wear-pads. 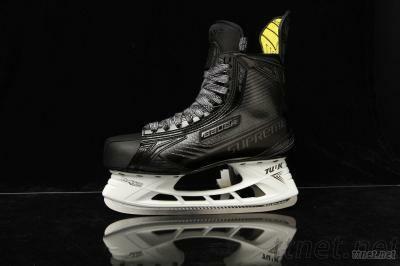 Ankle Padding: Lightweight Anaform foam ankle pads. Tongue Construction: Customizable 3-FLEX tongue with improved side protection. Footbed: FORM-FIT+ with stabilizer grip, Curv® composite inserts with ERGOTOE protection. Outsole: Ultra lightweight vented composite. Blade Holder: TUUK LIGHTSPEED EDGE. Runner: TUUK LS Fusion Runner.